San Diego Comic-Con unveiled some of the most anticipated movie trailers of the year to enthusiastic audiences. Thankfully, the studios made nearly all of the trailers available online for fans who were not able to attend the annual convention. And now, we have all of the best of them below, in one convenient place for your viewing pleasure. So sit back and check out the best of the San Diego Comic-Con trailers. 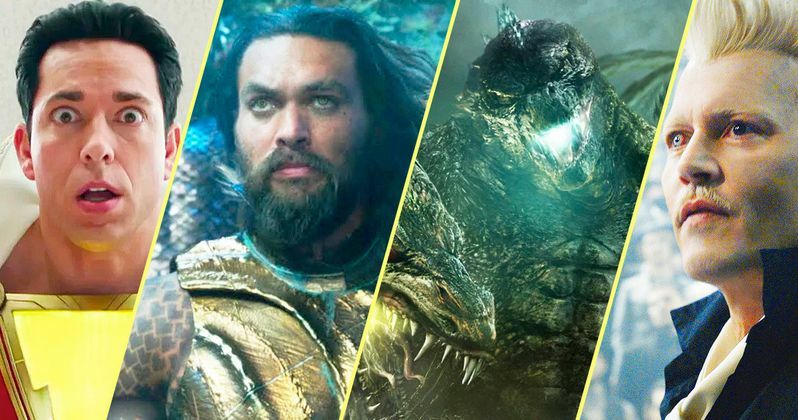 Easily the biggest Comic-Con trailers released all came from Warner Bros. as they unleashed a ton of never-before-seen footage celebrating some of 2019's biggest releases. DC came into Hall H with two trailers that wowed audiences. Aquaman was a huge hit, helping to restore faith in the DCEU (now officially known as Worlds of DC). And Shazam! took the audience by storm, giving everyone a peek at the Big-inspired superhero comedy that looks fun for all-ages. Warner Bros. also offered up the first Godzilla: King of the Monsters trailer, which delivered some big monster action. Warner Bros. continued their parade of trailers, showing off new footage from Fantastic Beasts: The Crimes of Grindelwald. The first sneak peek at RZA's Cut Throat City follows a group of friends forced to plan a heist in the aftermath of Hurricane Katrina to save their lives. Perhaps one of the most anticipated trailers of the entire event was M. Night Shyamalan's Glass, which serves as a sequel to both his Unbreakable and Split. Bringing James McAvoy together with Bruce Willis and Samuel L. Jackson was an event in and of itself, and this trailer did not disappoint. The BuyBust trailer brought big action to the San Diego Convention Center. But it was Sheborg, with it's puppy-eating robotic human killing machines that wins the WTF award for Comic-Con 2018. And Anime fans were treated to the first trailer for upcoming Funimation release Dragon Ball Super: Broly, which went over huge with its intended crowd. The studios did hold quite a few trailers back, making them exclusive only to Comic-Con. Wonder Woman 1984 brought its first footage to Hall H, showing off a massive mall attack. None of the new Venom footage was shown, though it impressed the audience with its copious amounts of gore and violence as the famous symbiote bites off a head and tears off limbs. Transformers Bumblebee Comic-Con footage also made an impression, but fans outside the convention center will have to wait until a later date to see what was shown, which reveals Cybertron, new Deceptions and a holographic Optimus Prime. Michael Myers was another one that wowed the crowd in Hall H, but fans at home didn't get to see the iconic slasher go on a random killing spree in this new footage from Halloween. The same goes for the new footage from The Predator, which was reportedly very violent but ever made it online. We do have everything that was released here, so sit back and check out the best of the San Diego Comic-Con trailers. DC Fans had been waiting for what seems like forever to finally see what Jason Momoa and James Wan have done with Aquaman. The trailer show off a vibrant palette of colors that hasn't been truly represented in any other movie from DC Films and Warner Bros. However, there is still that trademark darkness thrown in the mix. Will the movie be able to make Aquaman one of the cooler superheroes? We'll just have to wait and see. David F. Sandberg's Shazam! was another one of the most anticipated of the San Diego Comic-Con 2018 trailers. The superhero movie highlights a different kind of hero than the DC universe is used to putting up on the big screen. Shazam! looks like a lighthearted take on the superhero genre and the fun that one can have with all of those powers. Without a doubt, the Godzilla: King of Monsters trailer was one of the most highly anticipated of the bunch. We last saw Godzilla on the big screen back in 2014, but he's back and he brought along some friends. Roda and Mothra are clearly visible, but King Ghidorah was obscured in Antarctica, frozen under ice, which has left many fans speculating about how the beast will break out. The action-packed thriller is still being talked about, which bodes well for when the movie hits theaters next May. M. Night Shyamalan's Glass owes a bit of debt to San Diego Comic-Con. When 2000's Unbreakable hit theaters, it was not a massive success. However, throughout the years, the comic book movie gained a cult status, partly thanks to Comic-Con. In addition, Shyamalan met James McAvoy at a Comic-Con party before Split, so one could say that Comic-Con brought everybody together for Glass. The trailer brought down the house and is still being talked about right now. The latest trailer for Fantastic Beasts: The Crimes of Grindelwald premiered at Comic-Con and it featured the historical character Nicolas Flamel. Flamel is responsible for the Philosopher's Stone and he's going to be an integral piece in helping to take down Johnny Depp's Gellert Grindelwald. The new trailer showed off just how sinister Grindelwald is going to be on the big screen, which has some Harry Potter fans divided. The Dragon Ball Super: Broly also made its debut at San Diego Comic-Con 2018 and it has fans completely excited. The international trailer dropped ahead of our new English dubbed version, which sees Goku battle a powerful Saiyan. It's just as over-the-top as you can imagine and it does a great job of raising the hype before the January release. RZA arrived in San Diego with a first look at his new movie, which isn't another Kung Fu epic. Cut Throat City shocked the musician's fans who were in attendance, because this crime thriller looks like a huge departure for the rapper-turned-filmmaker. The movie follows three friends in post-Hurricane Katrina New Orleans who engage in a heist gone wrong. They soon find themselves in over their heads, and must pull off another almost impossible job to make things right. This is going to be something different, and it definitely shouldn'tt be compared to this year's earlier bomb Hurricane Hiest, which was a bad B movie. This looks like a hard hitting crime drama that could even win a few awards come Oscar time. Dropped early during Comic-Con, Sheborg is perhaps the weirdest trailer to debut this past weekend. The story follows an alien fugitive that crash lands into a local puppy farm and begins turning people into mutated robot killing machines with a taste for puppy flesh. The action is hard hitting, the concept is bonkers, and it's two minutes of madness that we dare you to watch. Sheborg isn't coming from a big studio. But it certainly could win an award for most insane movie of the year. BuyBust is a little under the radar, but it's one movie that action fans do not want to miss out on. The Philippine action thriller that has been getting rave reviews in North America and director Erik Matti declares that it's the best movie that he's ever done. The trailer is intense and relentless, so don't sleep on it when it hits theaters next month.